I love designs that use all those orphan beads that are never enough for a full project. 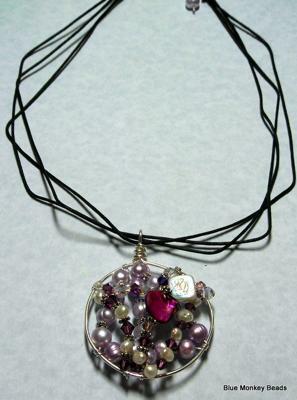 This is a 1 1/2 inch wire circle, wrapped with pearls, crystals and spacers. It is hung on 5 pieces of leather cording. Thanks! I'll try it again maybe on chain or strung on beads. I have a few friends who aren't "girly" but still like nice things, so I was going for something they could wear. I love the pendant. It has a sense of elegance and the colors work well. I would have liked to see the pendant hung from something more striking or compatible--something that would have made the pendant look more expensive. But good job!